If you haven’t been watching HBO’s new western sci-fi, we highly recommend checking it out. If you have then you understand just how compelling this funny and smart work of content marketing is oh-so-perfect. 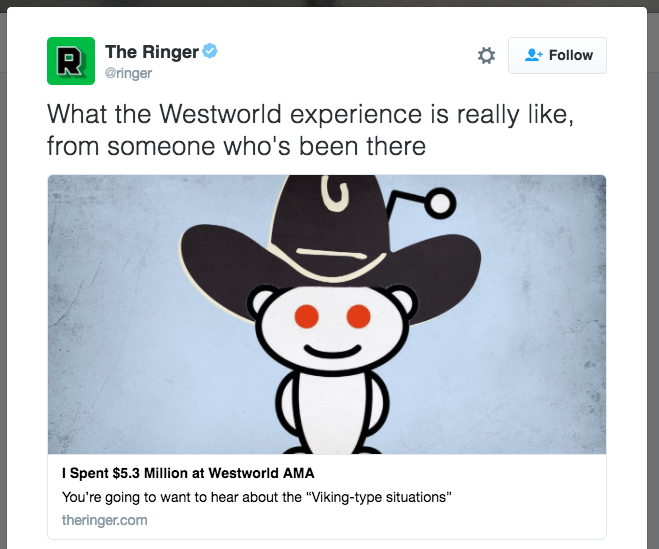 Granted, Westworld is easy to get people excited about, especially since it’s premise is so very believable. The perfection of this piece is adding in the element of the site Reddit and it’s very popular format of AMA (“Ask Me Anything”). Startup Weekend Barcelona: We’re Mentoring! Hey Barcelona startups (and the rest of the world, really…) — we’re excited to share that our Chief Left Brain, Attiya Abdulghany, has been selected to mentor and coach at Startup Weekend Barcelona Global Edition. So, what’s the event all about? http://www.oliverandsons.com/wp-content/uploads/2016/11/How-We-Work-8.png 400 790 attiya http://www.oliverandsons.com/wp-content/uploads/2017/03/logo.png attiya2016-11-01 19:59:182017-11-24 13:45:18Startup Weekend Barcelona: We're Mentoring!